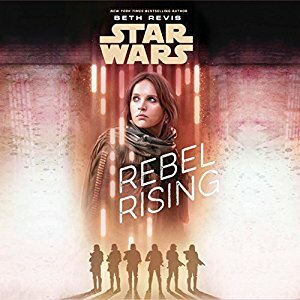 Rebel Rising by Beth Revis was released this week, somewhat under the radar. To be honest, I did not even know this book was going to be released, but when I discovered it had been published, I went right to reading/listening. One thing is for sure, we know a lot more about the growing up years of Jyn due to the telling of this story. The audiobook is shorter than your typical run time probably due to the fact that this is meant for a younger audience. The content, however, is far from safe and youthful. This book is pretty dark and covers the time between when Jyn Erso was picked up by Saw Gerrera and the moment she was rescued from the prison by the rebellion. The narrator, Rebecca Soler, was a great choice for this novel because of the fact that she is able to perform a great Jyn style voice. She has also narrated many books in this particular genre. The music seems more sparse in this production. I did not pick up on any new music. There are a couple of tracks from the Rogue One soundtrack that I would have loved to hear. None of the Rogue One music was used in the novelization of the movie either. I say bring it on in the future. With new music coming out every year and the Rebels animated series adding music to this universe, it would be cool to let it all be heard in the audiobook productions. Rebel Rising. There are periodic touch points or interludes inserted through the novel as journal reports from the prison she is being held in on Wobani. It is a constant reminder of how she matures. From the beginning, to the prison, to the middle, to the prison and so on, we, as the reader, are constantly brought back to the version of Jyn at the beginning of Rogue One. Overall I enjoyed the book. I am not sure if I want any more info from this era. I like leaving a little to our imagination. Beth Revis took the characters to different places and held my attention the whole way. I was always eager and satisfied to see the outcome of each stage of Jyn’s life unfold. I do recommend this book, especially if you are Jyn fan. And how could you not because she rocks! You can purchase the audiobook Rebel Rising here. Thank you to Penguin Random House for providing this audiobook for review purposes.